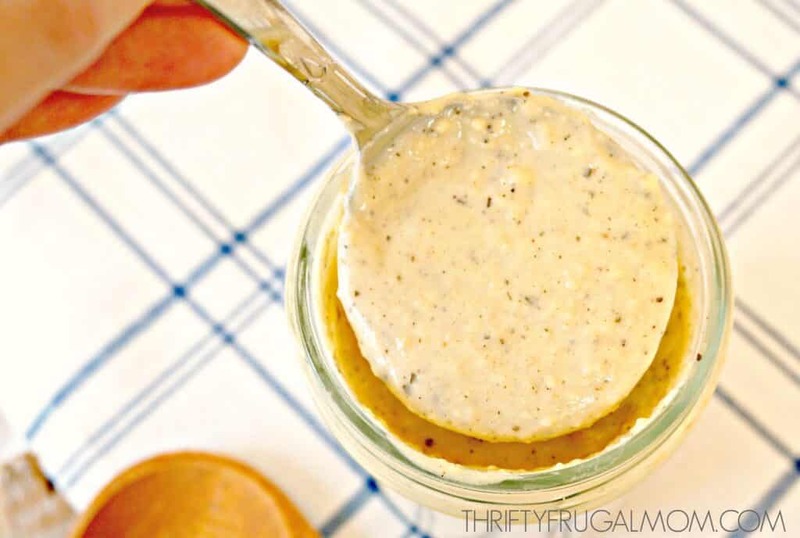 Looking for a good homemade Alfredo sauce recipe? This healthier Alfredo sauce is half the calories of classic Alfredo, but just as good! It’s so easy to make and freezes really well too! I have fond memories of making full fat Chicken Alfredo from scratch for my husband back when we were dating. The poor guy was baching it, and while he did an amazing job of keeping up with laundry, cleaning, organizing and the like, he kind of suffered in the food department. He hated to cook (that hasn’t changed!) and didn’t like to spend more money that necessary (that hasn’t changed either! ), and since he’s not really a big foodie, he just found it easier to eat very simply…and cheaply. As in every day for lunch, he had cheap bologna sandwiches with no cheese on the least expensive store bought white bread he could find. Thankfully he also consumed lots of fruit and veggies too, so hopefully that helped counteract some of the awful ingredients in some of the “cheap” food he consumed! At any rate, his food left a lot to be desired most of the time in the taste department. So when he came to visit me at my parent’s place on the weekends, I liked to try to feed him well! Fast forward several years and I was now a young mom with a few stubborn extra pounds, facing the realization that I could no longer eat whatever I wanted, whenever I wanted and maintain a healthy weight. For the first time in my life, I started caring about how many calories were in the food that I ate. In fact, in an effort to get rid of those stubborn extra pounds, I began calorie counting, and it of course didn’t take me long to figure out that traditional Alfredo sauce isn’t exactly going to be your best friend when you’re calorie counting! 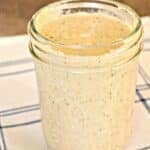 I started looking for a way to make it healthier and stumbled across the idea of making homemade Alfredo sauce with cream cheese and milk instead of heavy whipping cream. What?! Now that sounded doable! And I loved that it was cheaper to make too! After some experimentation and tweaking, I finally came up with this healthier Alfredo sauce recipe that we love. In fact, it’s so yummy that I don’t think you’ll even realize it’s not the classic full fat Alfredo! And while it’s still definitely not a health food recipe, I love that I can enjoy it occasionally without guilt, since it has right around half the calories of classic homemade Alfredo sauce. And of course if you compare it to store bought sauce, it’s a total win! Because it contains just 8 simple ingredient, unlike any jar that you pull off the shelf. 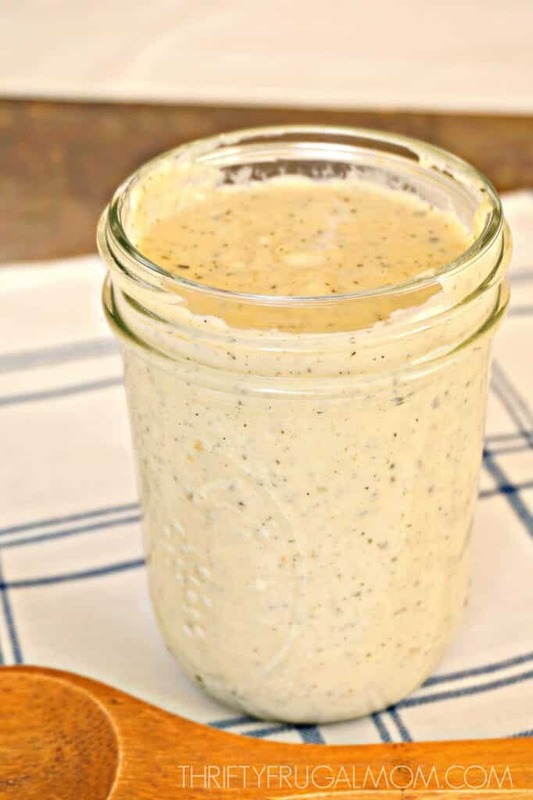 We love this homemade Alfredo sauce over pasta, as a sauce on pizza (I often mention our Chicken Alfredo Pizza in my frugal menu plans), mixed with tomato sauce as a bread dip and in this Applebee’s Spinach Dip. You sure can! I freeze this homemade “healthy” Alfredo sauce all the time. In fact, I often make a double recipe to save time and then just freeze what I don’t need to use later. The consistency changes every so slightly, but it’s not enough to matter. (If using granulated garlic, you can skip this step and just add it and the melted butter to the blender mixture.) Melt butter in a sauce pan over medium high heat. Add garlic and saute for about 30 seconds. Be careful not to burn it! Place milk, neufchatel cheese, flour, salt, pepper and Italian seasoning in a blender; blend until smooth. Add milk mixture to the saucepan. Stir constantly for about 3 or 4 minutes or until it just so simmers. Continue to stir and let it cook for a few more minutes until it thickens. It won't be super thick, but will not be as liquid as it had been. Once thickened, remove pan from heat. Add the Parmesan cheese, stir until melted. Cover and let stand for at least 10 minutes before using- the sauce will continue to thicken as it sits. Add additional salt if needed. This Alfredo sauce will become almost solid when refrigerated. Once reheated though, it thins down again. If it still is thicker than you prefer, just add a bit of extra milk to get it to the desired consistency. This Alfredo Sauce also freezes well! I often make a double batch and freeze half of it. This looks really good! I love alfredo, but hate how heavy it is. I will have to try this out and I LOVE that it freezes. Yes, the fact that it freezes really well is so convenient! Definitely helps save me time when I can whip up a double batch and pop some in the freezer for an easy meal later on. I do love a good Alfredo sauce on just about anything from veggies to pasta. I'm pinning this to come back to it this week for meal planning! I'm with you...there's not much that Alfredo Sauce isn't good on! ;) Thanks for pinning! LOVE this lightened up version and it looks so creamy and delicious...I have to try this next time! Wow... this looks fabulous! I can't wait to try it myself! Thanks, Kim! Hope you enjoy it as much as we do! My family loves alfredo sauce and I'm picky about it, as I read the ingredients this one looks awesome. Thanks for sharing! Hi!! Just made this sauce and is very delicious!!! My 9 yr old loves the jar sauce but after looking up the ingredients I said no more I came upon your website and after reading your story I went to buy all ingredients and just made it. My husband loved it, my girl loved and I loved it. Thank you so much!!! One question do you know how many calories in a tablespoon???? Don't you love how easy it is to make your own? And so much healthier too! So glad it got the stamp of approval from the family- that's a big compliment! :) And I'm not entirely sure how many calories are in a tablespoon of this. I thought that I had included how many cups its makes in the recipe, but I didn't. However, in my original notes when I was experimenting with the recipe, I jotted some things down and I think it has around 115 calories in 1/4 cup. Which would mean that 1 tbsp. has around 28.75 calories. If you know how many cups the recipe made, you can also use this nutrition analyzer to figure it out too. Hope that helps! How do you like to freeze yours? Freezer jars, bags, containers? I love chicken Alfredo pizza!! And of course Alfredo sauce!! Thanks!! I love Alfredo sauce but rarely make it. I need to try your healthier version. 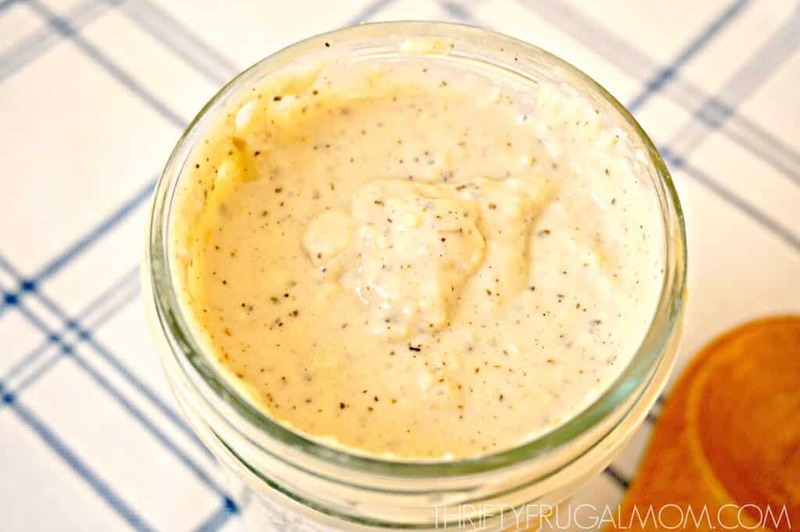 I love alfredo sauce, and making it at home is even better! It looks so creamy and delicious too.